When specifying flow, pressure, temperature or other wetted process control instrumentation there is a lot that needs to be considered. Flow rates, pressures, temperatures, I/O signals, material selection, etc. In addition to all of this the specifier needs to be concerned with safety, certifications, approvals, material integrity, weld integrity and of course quality. I am writing this to make you aware of an element of the material integrity that should be considered when selecting a device and/or instrumentation supplier - hydrogen embrittlement. Understanding Hydrogen Embrittlement Hydrogen embrittlement is a type of material deterioration which can be linked to corrosion and corrosion-control processes. It involves the ingress of hydrogen into a component. Hydrogen, being a small molecule, in some situations readily diffuses through the metal crystal structure where it can accumulate and seriously reduce the ductility and load-bearing capacity. This may lead to cracking and catastrophic brittle failures at stresses below the yield stress of susceptible materials. Hydrogen embrittlement occurs in a number of forms but the common features are an applied tensile stress and hydrogen dissolved in the metal. Examples of hydrogen embrittlement are cracking of weldments or hardened steels when exposed to hydrogen rich environments. Hydrogen embrittlement does not affect all materials equally. The most vulnerable are high-strength steels, titanium alloys and aluminum alloys. Some process instrumentation use high strength steel fasteners in the assembly. A hydrogen rich environment naturally occurs during the zinc plating process that is used to provide corrosion protection for many high strength fasteners. 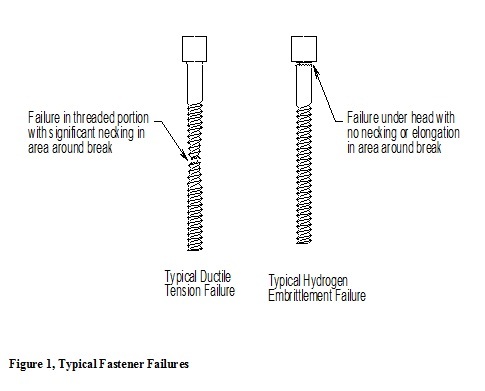 Special care must be taken in the manufacturing process of these high strength fasteners to ensure that they are not susceptible to hydrogen embrittlement. Eliminating the Risk(s) of Hydrogen Embrittlement Brooks Instrument eliminates the risk of hydrogen embrittlement by using 18-8 stainless fasteners where possible. The 18-8 stainless fasteners are corrosion resistant and immune to hydrogen embrittlement. All of the fasteners in Brooks Instrument size 0 mass flow devices (ex. SLA5850, 5850E, GF40 mass flow controllers) are 18-8 stainless. In the case where stronger screws are required, Brooks uses high alloy fasteners made by reputable manufacturers with tight control of the manufacturing and plating processes. We also require that all high alloy fasteners go through a high temperature baking process shortly after plating. This baking process drives out all harmful levels of hydrogen from the crystal structure. We also require that our suppliers certify each shipment. Because of these measures, Brooks has never had a field failure due to hydrogen embrittlement. Brooks Instrument Solid Sense II pressure transducers, with single piece (non-welded) sensor and low internal volume, are proven products not susceptible to hydrogen embrittlement. The sensor was carefully designed with high purity 316L stainless steel material and does not require any internal sensor welding techniques. The Brooks Solid Sense II pressure transducer also utilizes a high temperature annealing process to enhance the sensor robustness ensuring stable performance over time in all gas delivery scenarios. The Brooks Solid Sense II has been selected as the right pressure transducer by gas cabinet manufactures, tool OEMs and end users around the world. Some competitive pressure transducers have multiple piece designs requiring welding. Impurities introduced during chemical plating and/or welding operations, especially welding of dissimilar materials, may seed nucleation sites. These nucleation sites can result in hydrogen embrittlement which may lead to cracking and/or a change in sensor output. Pressure transducers impacted by hydrogen embrittlement failures could trigger a process or facility safety alarm impacting equipment availability resulting in very expensive maintenance and downtime. When you are specifying process control instrumentation, be aware of the potential for hydrogen embrittlement and the associated safety concerns. Be sure to ask your suppliers how they minimize the risk of hydrogen embrittlement. Select a supplier that is aware of and has proactively taken steps to minimize the potential for hydrogen embrittlement. For additional reading on fasteners, see, "The Nuts and Bolts of Bolting," written by Joe Dille – Lead Mechanical Engineer at Brooks Instrument for over 32 years and published in BMW Motorcycle Owner's Association – Owners News.